In the 1980s, when the Sistine Chapel paintings underwent a major restoration, I was lucky enough to be sent there for a BBC programme. The lift transporting everyone from the chapel floor to the vaults had broken down, so I had to clamber up a series of ancient ladders. But once I reached the summit, Michelangelo's ceiling was near enough for me to touch. The restorers were working on the dynamic painting where an astonished Adam is being created by the outstretched finger of a whirling, windblown God. Viewed close to, the energy and boldness of the brushwork were breathtaking. Sadly, today's tourists are allowed to gaze up for a very limited time. That is why a writer as perceptive as Andrew Graham-Dixon has an invaluable role to play in helping us grasp the immensity of Michelangelo's achievement. Informative and uncluttered by jargon, this book is published 500 years after the 33-year-old artist applied his first strokes to the Sistine ceiling. Determined to navigate between the theories advanced by art historians, Graham-Dixon wants to "synthesise the existing knowledge and present it, in accessible form, to the general reader". He refuses to get bogged down in the controversy about how much was painted by assistants. Most of the ceiling was, he asserts, painted by Michelangelo - and I remember arriving at the same conclusion when staring at these freely handled images from my elevated vantage in the 1980s. He likewise wastes little time debating the desirability of the restoration. The previous grimy greyness had been created by centuries of candle smoke, and I share his feeling that the cleaned version, with its brilliant colours, brings us much closer to Michelangelo's original. Early on, Graham-Dixon offers an arresting interpretation of the ceiling: "The fresco cycle as a whole radiates a powerful and sometimes oppressively strong sense of introspection. Looking at it feels almost nothing like looking at the real world. It feels, instead, like looking inside the mind of the man who created it." But that does not mean Michelangelo instantly seized on the Sistine ceiling as a personal obsession. Quite the reverse: he had no wish initially to accept his commission from the so-called "warrior pope", Julius II. After all, Michelangelo had acquired his early reputation by producing precocious sculpture. The most impressive of these carvings is not David in Florence, but the Pietà in Rome. Completed when he was only 23, it won him instant acclaim and ensured that Julius II would summon him in 1505. The project they discussed was a tomb for Julius, a shamelessly grandiose structure with more than 40 life-size statues. As Graham-Dixon observes, it was "a megalomaniac fantasy, an obscene monument to ego, pride and power". Michelangelo was furious when Julius cancelled the tomb in 1506. Having spent an enormous amount of time and money obtaining the finest marble from Carrara, Michelangelo demanded an audience with him. Time and again the papal equerry refused him entry. So the enraged artist stormed out of Rome, declaring he would never go back. And when the Pope wrote to him, probably with the demand that he paint the Sistine ceiling instead, his fury was unabated. Two years later, though, Michelangelo's mood had changed. His large bronze statue of Julius, intended for a church in Bologna, was melted down by the city's rebellious populace and turned into a cannon. So when the Pope summoned him to Rome in spring 1508, he finally capitulated. Maybe he realised that the chapel could, after all, become a major showcase for his work. Built three decades earlier, it was the principal place of worship for the Pope and his senior officials. Moreover, it housed the cardinals during the all-important conclave, when they camped there and elected a new pontiff. 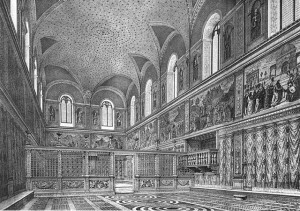 The more Michelangelo thought about the chapel's potential, the more ambitious he became. So when Julius proposed merely 12 images of the Apostles, along with a ceiling decoration tamely based on Nero's Golden House, Michelangelo was frank. The Pope's suggestion was, he protested, "a poor thing". Instead, he conceived an epic scheme of nine scenes from Genesis, accompanied by figures of the prophets and sibyls who had prophesied the coming of Christ. Along with paintings of Christ's ancestors in the window arches, the project now contained 175 separate pictorial units. And they would all be unified within a vast imaginary architectural structure as overwhelming as Julius's abandoned tomb. Michelangelo must have been delighted when Julius gave him the go-ahead. But its execution turned into a gruelling four-year ordeal. On one occasion he became dissatisfied with his assistants and locked them out of the chapel; he suffered continually from "cramps, spasms and headaches". He even drew a caricature of himself painfully upright and stretching towards the ceiling with brush in hand (disproving the legend that he painted the Sistine lying down). The poem he wrote alongside the caricature complains that "I've got myself a goitre from this strain" and describes in excruciating detail the pains that assailed him while working in the chapel, before grimly concluding: "I'm not in a good place, and I'm no painter." The wonder is that this desperately frustrated sculptor ended up painting such a sublime masterpiece. Because it is now reproduced so often, we might take the Sistine ceiling for granted. But Graham-Dixon emphasises that "the pictures of the ceiling stunned and impressed the artist's contemporaries not only because they were so accomplished but also because they were so deeply unorthodox and original." Take the most celebrated of them all: The Creation of Adam. Graham-Dixon stresses that there was no precedent for showing God flying like a comic-strip superhero through the air, "let alone dressed in clinging draperies that reveal his legs from the thigh down. The fingertip act of creation was also Michelangelo's own invention." The hirsute creator stares at his own outstretched finger with turbulent intensity, as if realising that man will break the laws by which God wants him to live. Hence the "slight implication of melancholy" that Graham-Dixon finds in Adam's gaze. Even at his moment of attaining an ideal harmony with God, Adam already senses that it is "destined to be lost, and never recaptured until the blessed rise on the day of the resurrection". · Four paperbacks of Richard Cork's critical writings on modern artists are published by Yale. The Sistine Chapel is one of the most famous painted interior spaces in the world, and virtually all of this fame comes from the breathtaking painting of its ceiling from about 1508-1512. The chapel was built in 1479 under the direction of Pope Sixtus IV, who gave it his name (“Sistine” derives from “Sixtus”). The location of the building is very close to St. Peter’s Basilica and the Belvedere Courtyard in the Vatican. One of the functions of the space was to serve as the gathering place for cardinals of the Catholic Church to gather in order to elect a new pope. Even today, it is used for this purpose, including in the recent election of Pope Francis in March 2013. Originally, the Sistine Chapel’s vaulted ceiling was painted blue and covered with golden stars. The walls were adorned with frescoes by different artists, such as Pietro Perugino, who painted Christ delivering the keys to St. Peter there in 1482. 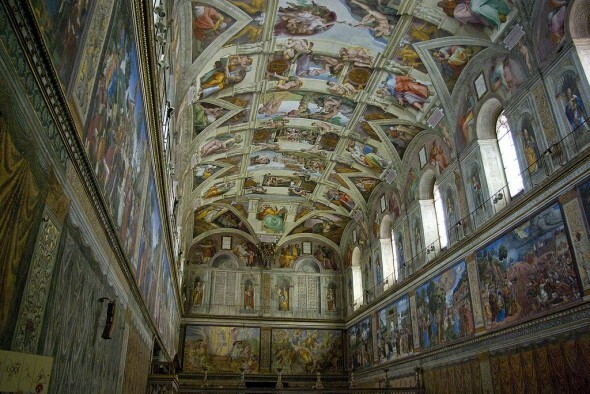 In 1508, Pope Julius II (reigned 1503-1513) hired Michelangelo to paint the ceiling of the chapel, rather than leaving it appear as it had. Before this time, Michelangelo had gained fame through his work as a sculptor, working on such great works as the Pieta and David. He was not, however, highly esteemed for his work with the brush. According to Vasari, the reason why Julius gave such a lofty task to Michelangelo was because of the instigation of two artistic rivals of his, the painter Raphael and the architect Bramante. Vasari says that the two hoped that Michelangelo would fall flat, since he was less accustomed to painting than he was to sculpting, or alternatively he would grow so aggravated with the Julius that he would want to depart from Rome altogether. Rather than falling on his face, however, Michelangelo rose to the task to create one of the masterpieces of Western art. The ceiling program, which was probably formulated with the help of a theologian from the Vatican, is centered around several scenes from the Old Testament beginning with the Creation of the World and ending at the story of Noah and the Flood. The paintings are oriented so that to view them right-side-up, the viewer must be facing the altar on the far side of the altar wall. The sequence begins with Creation, above the altar, and progresses toward the entrance-side of the chapel on the other side of the room. Michelangelo began painting in 1508 and he continued until 1512. He started out by painting the Noah fresco (entrance side of chapel), but once he completed this scene he removed the scaffolding and took in what he had completed. Realizing that the figures were too small to serve their purpose on the ceiling, he decided to adopt larger figures in his subsequent frescoed scenes. Thus, as the paintings moved toward the altar side of the chapel, the figures are larger as well as more expressive of movement. Two of the most important scenes on the ceiling are his frescoes of the Creation of Adam and the Fall of Adam and Eve/Expulsion from the Garden. In order to frame the central Old Testament scenes, Michelangelo painted a fictive architectural molding and supporting statues down the length of the chapel. These were painted in grisaille (greyish/monochromatic coloring), which gave them the appearance of concrete fixtures. Beneath the fictive architecture are more key sets of figures painted as part of the ceiling program. These figures are located in the triangles above the arched windows, the the larger seated figures between the triangles. The first group include Old Testament people such as David, Josiah, and Jesse – all of whom were believed to be part of Christ’s human ancestry. They complemented the portraits of the popes that were painted further down on the walls, since the popes served as the Vicar of Christ. 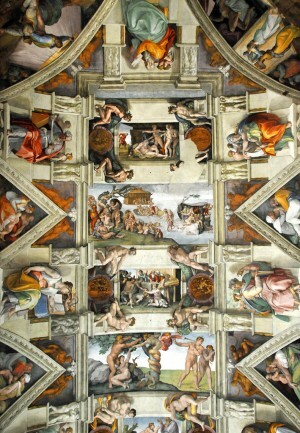 Thus, connections to Christ – both before and after – are embodied in these paintings which begin on the ceiling and continue to the walls. The figures between the triangles include two different types of figures – Old Testament prophets and pagan sibyls. Humanists of the Renaissance would have been familiar with the role of sibyls in the ancient world, who foretold the coming of a savior. For Christians of the sixteenth century, this pagan prophesy was interpreted as being fulfilled in the arrival of Christ on earth. Both prophets from the Old Testament and classical culture therefore prophesied the same coming Messiah and are depicted here. One of these sibyls, the Libyan Sibyl, is particularly notable for her sculpturesque form. She sits on a garment placed atop a seat and twists her body to close the book. Her weight is placed on her toes and she looks over her shoulder to below her, toward the direction of the altar in the chapel. Michelangelo has made the sibyl respond to the environment in which she was placed. It has been said that when Michelangelo painted, he was essentially painting sculpture on his surfaces. This is clearly the case in the Sistine Chapel ceiling, where he painted monumental figures that embody both strength and beauty.